Welcome to Royale Clans – Clash of Wars! Fans of strategy games, rejoice! The time of epic battles and desperate duels has come! 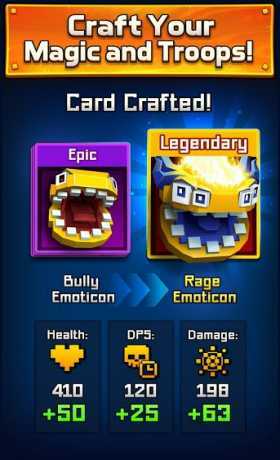 Discover and craft lots of cards behind each of which there are creatures of Royale Clans – Clash of Wars world: pixel dragons and knights, pocket zombies and mummies, combat robots and giant salamanders, as well as many other incredible beings. Defeat your enemy in a duel by going round his troops and demolish the defensive towers. You will get a crown of king as a token of your victory, as well as win renown in the arena! Best of all fun games! – Cool online battle! Dynamic real-time PvP combat like in coc! Challenge hundreds of players, who are always ready to fight for the glory of the crown. Best game ever! 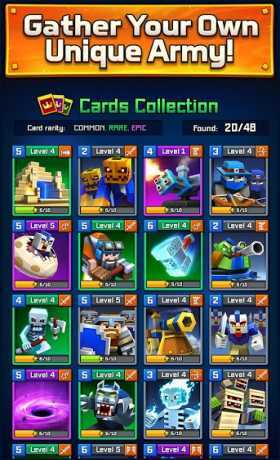 – Win and get a wide variety of chests full of treasures, collect new powerful cards and improve the ones that you already have; Make your own Royale Clans – Clash of Wars deck full of unbelievable soldiers and war machines. – Exciting gameplay and original graphics which lead you into atmospheric spectacular battles. 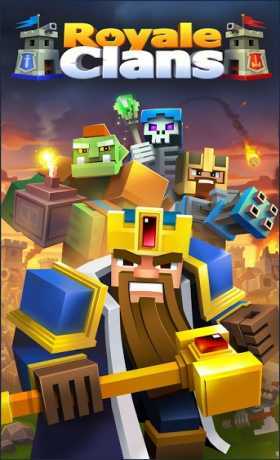 – Create an invincible army and fight your enemies; Drive your troops to conquer enemy towers, make good use of your most dangerous creatures and improve your King defence to the maximum! – Survive in various arenas and get to the top, become a true hero of Royale Clans – Clash of Wars! It is not an official application of Mojang. Company MightyBlocks is not connected with Mojang AB. Minecraft is a trademark of Mojang AB, and this product is not connected with the developer of this game or its licensors, and is not approved by them.